My brassicas are looking so good in the garden, I'm really proud of them this year. But I looked a little closer and I could see that my hungry gap crop, purple sprouting broccoli, was doing a little too well! It had started to produce the flower buds that we eat about 5 months early! I'm gutted really, although we'll still enjoy eating it, as it's a crop that is perfect for when there is little else about. I put it in no early than any other year, but it's been such a good year for growing that it seems to have run away with itself! I could do with a good cold snap now to slow everything else down. Anyone else had crops when they shouldn't this year? The nights are getting colder and the little bas##rds are starting to come inside. I'm referring to our furry little friends the mice. I've set traps for them, blocked up any holes I can see and yet they still find there way into the house. I hate hearing the trap snap shut but at least I know that's another packet of crisps they haven't eaten! In truth its not just this time of year we've been having problems with them, all year they've been a major issue in the garden. 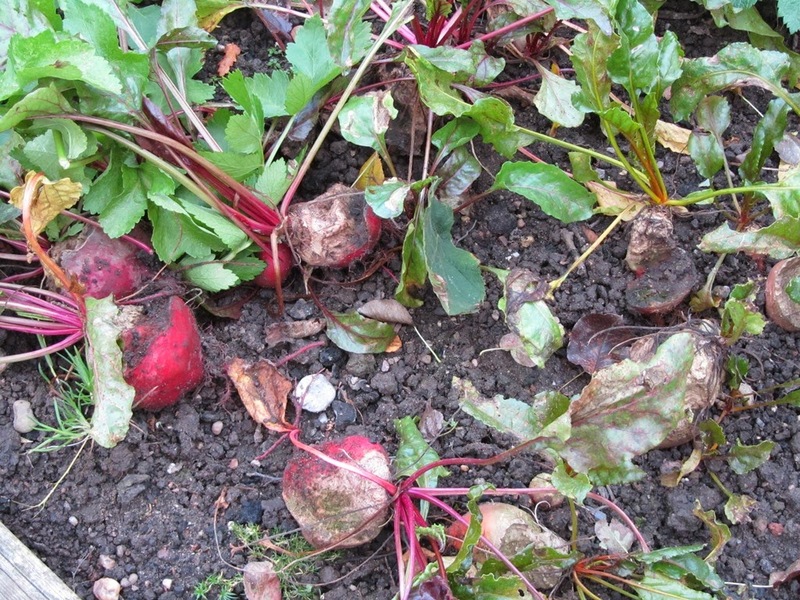 My mum has suffered worse with mice in her garden this year, above is a picture of what is left of her beetroot, not very appetizing I'm sure you'll agree. I didn't have a single strawberry this year. I blamed my inability with growing them, but I've seen the evidence and I know it's mice, my neighbour said she's caught 50 while her strawberries were growing! So any hints or tips on getting rid of them? I'd rather not get a cat as I'm just not a cat person, also many friend have said that you end up with more in the house as the cat brings them in for you still alive! I bait the traps with either peanut butter, chocolate or good old fashioned cheese (for the Tom and Jerry type nostalgia) and I can normally catch the one I'm after but I need to less the numbers considerably! With some heavy winds at the weekend one of our oak trees suffered the loss of one of its limbs. Typically this is the only tree that we've done some major work on trying to preserve, but the damage isn't too great. It amazes me when what seems like a small branch falls out of a large tree like this, the branch is as big as medium tree! Huge amounts of wood are in these trees! I'll do a post on the nine large oaks we've got here at some point. I'll have to get the chainsaw out next weekend and log the branch for some of next years firewood and then get my brother to climb up and tidy it all up a bit. Anyone else having to do work to try to stop their old trees falling apart? This years squash harvest has been particularly good and on Sunday Ev and me set about collecting them all up. I wasn't disappointed with the numbers! A good number harvested! Should keep us going for a while! All of these squash were grown in two 4ft by 10ft beds (although they do spread everywhere) with sweetcorn growing between them. I put down plenty of manure before planting but I only watered them when I put the plants in, which I started from seed in the greenhouse and I never fed them all season. I grew ones with smaller fruits this year as large ones have a habit of getting way too big, although some of these have gone the other way! One or two should make a good meal for our little family though. I've been talking to a number of bloggers lately about growing the staples we eat and the numbers we need to support us. I know I'm always going on about how wonderful squash are but I think we underestimate how important these veg were before the potato. We've got a great supply now that should see us well into the hungry gap, although I need to find somewhere to store them all first. How has everyone else done with squash this year? As I got back from work on Saturday, I slowly pulled into the drive to be confronted by a sparrow hawk ripping a pigeon to pieces. I sat about 10 yards away from him, with the engine running, and he didn't bat an eyelid. After about 5 minutes I decided to carry on driving in and he flew off. When I went to look at the pigeon, who had most of his insides outside, I realised that the poor bugger was still alive through the whole thing! I put it out of it's misery straight away but I was surprised that it could stay alive whilst that was going on! I guess you wouldn't come home to this kind of thing living in the town. It's amazing how fast a year goes! This week my youngest daughter turned one, it doesn't seem five minutes since she was born. Last weekend we used our free return pass to the Safari Park for a cheap day out for her and this weekend we're having a little party for her with some family and friends. Believe it or not we actually spent less on this visit to the safari park than last time as we had some animal food left over! The "Peppa Pig" cake - although this is actually Philipa Pig, Peppa's ugly cousin! She's already had her presents and a cake made my me. After making it I suddenly have a lot more respect for the cakes my mum used to make for our birthdays. This one looks like Peppa Pig has had some re-constructive surgery, every time I added food colouring the icing went mushy and then every time I went for the icing sugar to dry it out, poor old Peppa Pig looked like she'd been snorting coke! The girls managed to work out who it was though, so I guess so long as I improve each year, by the time they get critical I might have the skills to pull it off! I can't believe a year has gone already and I'm so glad I get to spend so much time with my girls. Everyday we think we made the right decision with me being a stay at home parent. She'll be helping me on the homestead in no time! It's that time of year again. It's dark when I get up and feed the chickens and it normally getting dark when I go out and close them in for the night. Time to change the batteries in the torches and make sure they're all working again. As soon as I got the batteries out Ev brought up her toy little camera for me to put new batteries in. I thought she's forgotten about it - the blinking thing is so loud! "IT'S PICTURE TIME!" it shouts at me about 75 times a day! I've been buying mine in "bulk" off eBay 50 at a time. It works out much cheaper, they have a long expiration date (2020) and it's nice to know we've got some spares if the power goes off for any length of time. My wife does tease me when parcels turn up at the moment though "What's this now? 50 boxes of matches?" As for the torches I've got four reasonably good ones: two head torches, one largish torch and a small one that's easy to slip in your pocket, none are rechargeable as I find when you really need they they are nearly always flat! I had a good gun lamp but that needs a new rechargeable battery before I can use it again and as it's so large it's quite expensive so I haven't got around to it yet. What does everyone else do when it comes to torches and batteries? How many do you keep about the house? 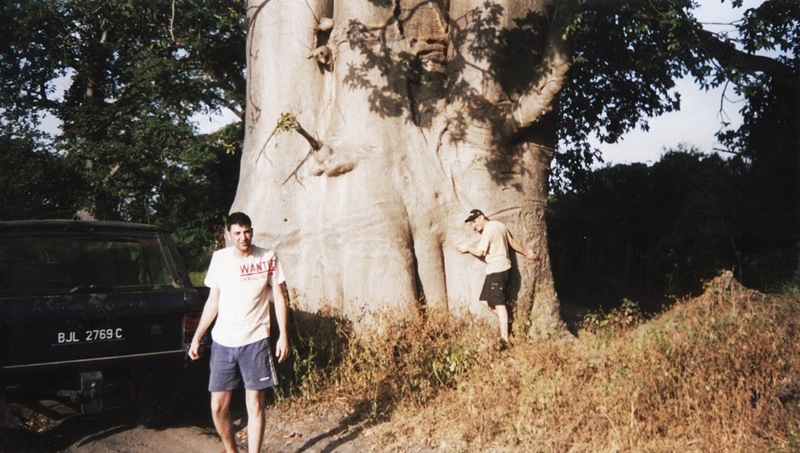 Around ten years ago I went on holiday to The Gambia. 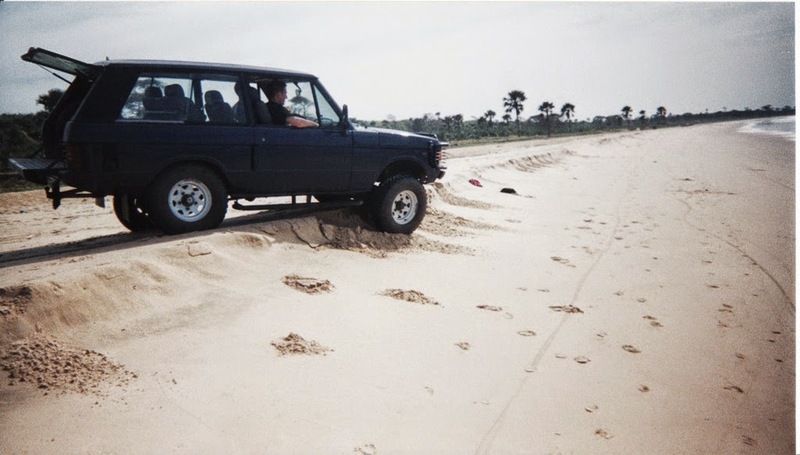 It was quite an adventure for me really. 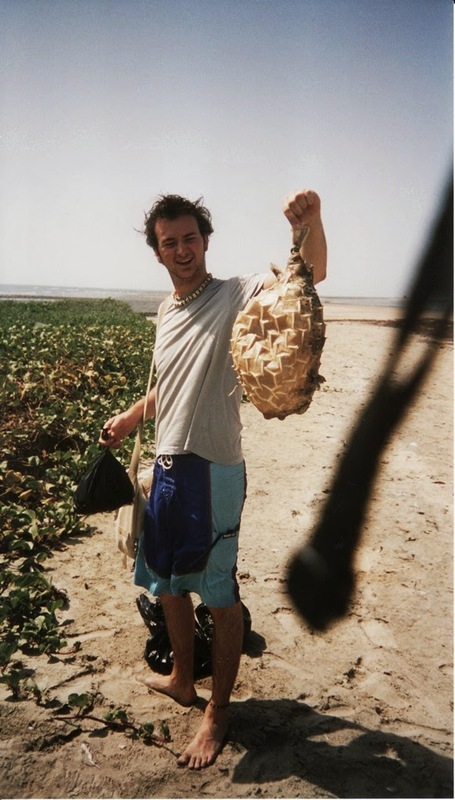 I'd been with my (now) wife since I was eighteen, so I hadn't been on any "lads" holidays before (I'd been backpacking on my own but this was with mates) and I'd never been to Africa before. There were three of us going, Terry (my best mate from college), Colin (a friend Terry had made when he lived in Australia) and me. 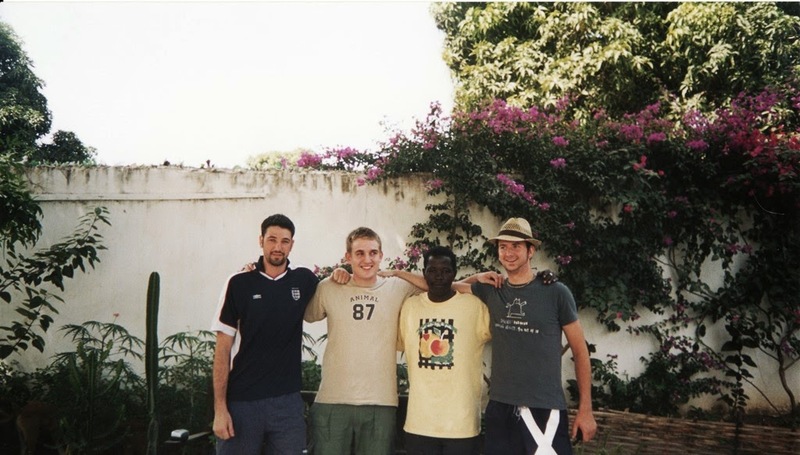 We were off to see a good friend, Olly, who'd moved out to Gambia with his mother to build and run a hotel and bar. When we arrived the hotel was under construction, the swimming pool was a big hole in the ground and our beds consisted of some squares of foam in an un-air-conditioned room that we'd all be sharing. The holiday was something of an education, I have many stories containing, among other things, getting drunk in a bookshop, getting left in a night club on my own until five in the morning, trecking the length of the coast in a Range Rover, out running fire engines on the road, flushing out the drunks from his bar with a dozen "African" dogs, and going through an army check points without stopping, because, in Ollys words "they can't afford the bullets!" It was great fun and I'm sure I'll remember it forever. We pretty much slept rough for the two weeks. Five of us on foam mattresses on the floor. No air con and no proper windows! 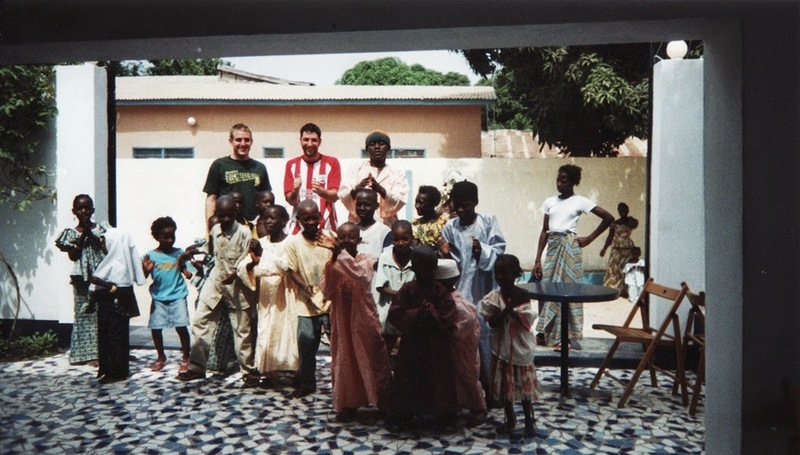 Tez and me with the local children who'd come to watch a film a couple of times a week. Now maybe I'm paranoid, but I'm thinking the last place I'd want to be at the moment is anywhere in West Africa (sorry Hippo). The Home Office say it's fine to travel to The Gambia and no cases have been reported there yet, but can you trust a country that's its main source of income from tourism to report something like Ebola? It would stop people travelling there overnight. So my question to you all is this: If you had paid for your flights and had no chance of getting the money back, would you still go on your honeymoon to West Africa? If there was an award for the most boring blog post then I'm sure that this would be up there, but I need your advice! Lately I've been destroying can openers like there's no tomorrow, any plastic part gets crushed or cogs get stripped. I've been resorting to using the broken can openers one little bit at a time, rather than winding them round, like you would a can opener on a multi tool. Well it's that or going outside and rubbing it on a paving slab for a few minutes and popping the top off - which works surprisingly well, there's a good video on YouTube about it here. Two failed can openers, there have been two more lately as well. The plastic parts seem to be what fails first. So the other day I brought an all metal one, but it isn't strong enough and the handle has already started to bend, that and it keeps slipping off the rim. I don't mind spending money on something that's going to last, and there seems to be plenty of choice out there, I don't want an electric one, just a good solid manual one. So your recommendations will be greatly received and I'll buy the one most people think is any good, even if I have to import it from the States! Sorry this is such a boring post but there's little point of having canned food if you can't open it and I'm fed up of buying rubbish! The last few weeks has seen some of my more unusual fruit ripen on our little homestead. The first was the musk melon, although to be fair to it I think the vine died off before it had chance to ripen fully. As such it was a little tasteless, completely edible though and probably alright in a fruit salad. I will try to grow these again though, as I planted them pretty late so they didn't really have a fair shot at producing fruit with such a short season. The second was our little Cocktail Kiwi plant. This tastes amazing, just like normal kiwi fruits only with no fuzz so you just pop the grape sized fruit straight into your mouth. I recommend planting this to anyone reading this blog. The books say when it's mature it can produce a thousand fruits so great for preserving. Another new fruit (to me anyway) is the Chilean Guava. This is another great tasting berry. The only down side is the skin is a little tough, luckily the fruit is so nice tasting, like a spiced blueberry, that you don't notice the skin too much. I'm glad I've got six of these plants, they have put on no end of growth this year, so hopefully I'll have plenty of berries in the future. Has anyone else grown or eaten any interesting fruit this year? I've got a friend in the Royal Marines who I met up with the other night for a drink. He gave me a 24hr ration pack to try. I was quite surprised how much was in them and what a good selection of stuff there was, although I'm sure you'd soon get bored with it. My friend says as soon as they're dished out everyone starts swapping bits and bobs with people and making a fuss they don't like tuna! The main meal pouches: Apple and cinnamon muesli, Tuna Pasta beans, Steak and vegetable & Chocolate brownie. Sundry items: Spork, wipes, chewing gum, tissues, matches, water purification tablets & Tabasco sauce bottle. I was quite impressed with all this but I haven't tried much of it yet - I'll save it for a rainy day! So the question I have for you all is what would be in your emergency 24hr ration pack? I know it's not even been a month since I pickled the chilli peppers but I couldn't resist trying them as I've got a load more chillies ripening and I want to know what to do with the them. I cracked the jar open at a friends house on Thursday and we all tucked in. They tasted just like a certain brand that you find on supermarket shelves. A little longer in the pickle needed to soften the skins maybe, but a definite hit in our house (and our friends!). They're pretty mild but that's a good thing with a family full of little ones. So next week I'll be pickling the rest of the chillies and going through the same process again. We use these peppers all the time, in sandwiches with cream cheese, chopped up in salads or each fitted with a chunk of feta and eaten as a great snack, but it'll be great to be using our own rather than expensive shop brought ones. The seeds form these chillies will be in the Seed Swap so if you want some let me know. Next year I'll try and find a similar shaped chilli that's hotter to do some spicier ones for adults only. Anyone recommend a good medium heat chilli that would pickle well? Even better if you've got some seeds to swap with! I remember travelling across North America many years ago when a lady asked me, in a deep southern accent: "Is it really foggy in England?" Well not all the time but I guess we have our fair share of it in the winter, but his time of year it's more misty mornings, hanging in the lower lying land. It does look beautiful. An alright view to wake up to! I never get tired of seeing it! The season is still hanging on in there, I'm sure we'll have a frost soon to finish things off, but until then everything keep growing. As it gets damper and cooler things start to die off naturally anyway. My squash are now starting to get covered in powdery mildew, this looks almost like snow on the leaves up close. They've produced me a bumper harvest anyway and I can't wait until they die off so I can see how many there is! I love the colours of autumn and all the food that goes with it! These have just been collected around the edges of my patch! We had our last lot of runner beans last night, and it won't be long until I cut down the tomato plants and chuck them on the compost heap, the peppers are nearly all ripe and I'll pickle the last of them next week. It's been an amazing year for growing in the UK, making up for many bad ones (2012 for one). I was sat under one of our old oak trees at the weekend. When I looked up I decided that it's "face" didn't look to happy! This is a beautiful old tree and I'm fairly sure it's hollow all the way down. I must climb it one day, or get my brother to! We are lucky to have such interesting trees on our land, this old oak is slowly dieing as it's hundreds of years are drawing to a close, maybe we will be it's last custodian or maybe it will out live me yet. Can everyone else see the face or am I just being odd? P.S Sorry to the person who posted on this when blogger put it up too soon the other day - I seem to have lost your comment.